We have a huge selection of memorial plaque options available. Styles include traditional simplicity, decorative designs and custom choices. Memorial plaques can deliver a truly beautiful presentation and elegant statement for your special tribute. Memorial plaques offer a wide selection of design choices. Plaques may be added to headstones and tombstones or incorporated into designs as an added motif. You can choose directly from our range or ask our expert masons about custom design and motifs. We can walk you through our many, differing design options and help with any special requirements for your memorial plaque. See our gallery of granite plaques and bronze plaques to familiarise yourself with our range. Browse these designs as a helpful guide and consider your preferences for style. 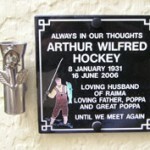 Also, feel free to browse our range of memorial plaque wording and decorative features. Our memorial specialists can design any of these choices and many more, according to your needs. If you’d like to incorporate a special design or would like some help with your decision and plaque wording, we’ll be happy to assist. Granite plaques include a broad range of designs in elegant stone. Plaques are made of solid stone with design, wording and lettering depending on your style preferences. 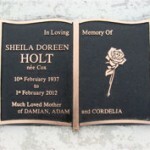 Our range of bronze plaques includes traditional and contemporary designs on a single plate affixed to the memorial. You can optimise your lettering and layout styles, including colour options and memorial design integration. Our touching ‘In Loving Memory’ plaques can be customised with motifs, including floral and photographic imagery. Speak to our expert crafters about your alternative design choices. If you’d like to find out more regarding our design services for memorial plaques in Auckland, give us a call and to speak to our professionals. Call 0800 733 433 or use our online contact form and we’ll respond to your enquiry ASAP. If you’d like to see our product range for yourself, visit one of our showrooms in Auckland and discuss your needs with our experts.